Bracket designed by Kristen O’Callaghan. View it full-size here. 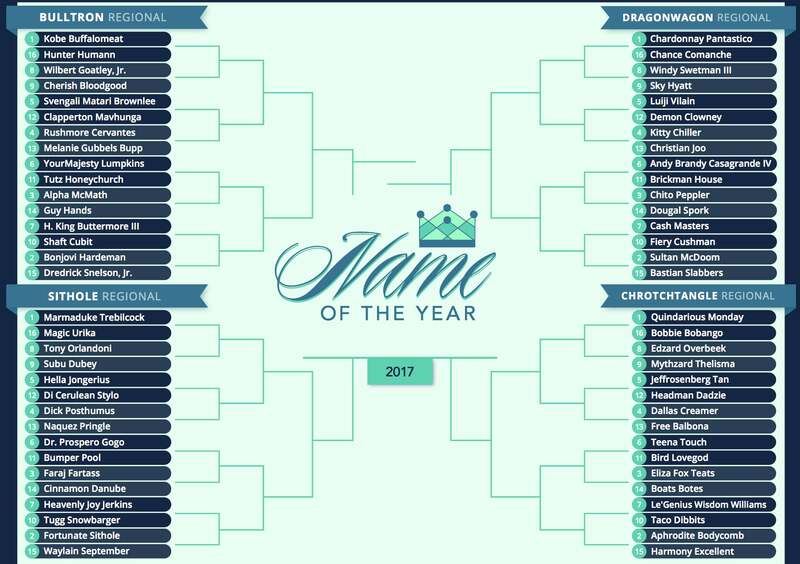 I’m not discussing the heft of these names to shoehorn politics into the yearly distraction we provide, but rather to remind our voters-to-be that names carry a powerful legacy. Each person’s choices leave indelible marks on the words they bear as their own, and for family members, progeny, and even completely unrelated people, the effects can be massive — perhaps even massive enough to alter an entire nation’s political landscape. But enough of that. We both know why you’re here. Let’s talk about Kobe Buffalomeat. Through an offensive lineman from Kansas, those two lineages have formed a beautiful union, and as a result, young Kobe has been able to add new chapters to the tales of his first and last names. A NOTY championship would bring further fanfare to the histories of his handles. To earn that reward, he’ll have to outlast 63 other names that are all vying to cement their own onomastic legacies. Some naminees, such as Dragonwagon Regional eight-seed Windy Swetman III, speak of multiple generations of breezy perspirers. Others, like Chrotchtangle Regional ten-seed Taco Dibbits, reveal a culture clash between a common Dutch name and a beloved Mexican foodstuff. Some names even remind us of the legacy created by our own enterprise. Godfrey Sithole is so revered among the NOTY High Committee that one of our four regions is named after him; now, in 2017, it is another Sithole, a truly Fortunate Sithole indeed, who will try to bust his way through Godfrey’s bracket to reach the Final Four. Which name will add a glorious victory to its legacy? That, my friends, will be up to you. We will post matchups over at our website, and you will decide them. The best way to learn about these matchups as we post them will be by following us on Twitter. Ultimately, only one contender will remain. Will it be YourMajesty, King, or Sultan? Gogo or Bobango? Guy, Sky, Fiery, or Di? Choose wisely—the future depends on it. Sam Gutelle is a Brooklyn-based blogger who predominantly covers the online video industry for Tubefilter. He has helped run the Name of the Year blog since 2012 despite his relatively boring name. You can follow him on Twitter @gutelle.